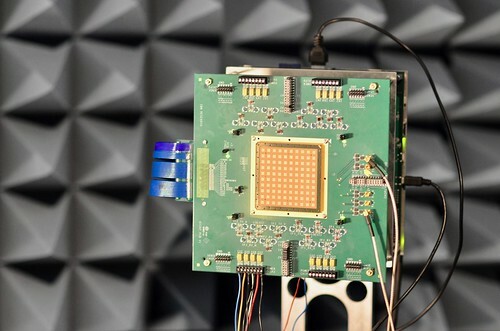 At the International Solid-State Circuits Conference (ISSCC), IBM and Ericsson announced what they claim is the world’s first reported Si millimeter wave phased array antenna module operating at 28 GHz. The module is the result of a two-year collaboration between IBM Research and Ericsson, intended to develop technology for 5G infrastructure. The module consists of four MMICs and 64 dual-polarized antennas and measures approximately 2.8" x 2.8" — about half the size of a typical smartphone. The module and MMICs are designed for concurrent dual polarization operation in transmit and receive. This enables one phased array antenna module to form two beams simultaneously, doubling the number of users that can be served. The phased array design supports beam-steering resolution of less than 1.4 degrees. 28 GHz is a leading band for 5G, with both AT&T and Verizon planning U.S. field trials for fixed wireless access services this year. In July of 2016, the FCC allocated 11 GHz of millimeter wave spectrum in the U.S. to support wireless development, including bands at 28 and 39 GHz. Thomas Noren, a senior advisor at Ericsson, said, "There has been a lot of encouraging progress in 5G standardization last year including the beginning of live field trials. Big efforts in research and development are key to this and our collaboration with IBM Research on phased array antennas can help operators to effectively deploy radio access infrastructure necessary to support a 5G future." Dario Gil, vice president of science and solutions unit at IBM Research, said, "The development of this 5G millimeter wave phased array is an important breakthrough, not just because of its compact size and low cost, which make it a very commercially attractive solution for network equipment companies and operators, but its potential to unleash and inspire brand new ideas and innovations we haven't yet imagined, thanks to a fully networked society." Click to see photo album on flickr.